Do you have an idea on what the 10 best LED desk lamps are? If you don’t then you should read on to know what they are and why go for them. 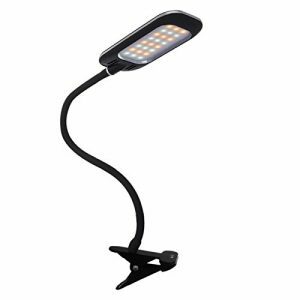 The popularity of LED desk lamps is on the rise as people seek for convenient, energy-efficient and dependable light sources for use in a small space. This comes at a period when most of us spend lots of time reading, writing, drawing, or using handhelds devices on the desk. However, at times, we only need to light up a small area so as not to disturb other people, improve the lighting and also to conserve the lighting. These are some of the reasons that brought about this review. Brightness: It should produce the right light that is just perfect for the need at hand. Not too bright and not too dull. Stands: A good choice will come with easy-to-fix stand that don’t require too much effort or using special tools. The stands will also be flexible, adjustable and firm. Stylish: Desk lamps not only provide lighting but also influence the elegance of the desk and surrounding. It’s desirable to go for trendy and stylish ones that complement the furniture, wall, and other accessories. Energy Efficiency: It’s critical to choose a product that produces maximum lighting, consumes minimum energy and also produce minimal heat. Adjustability: Always go for types whose height, position, angle and light intensity can be adjusted. Ambertronix has gone out of its way, to offer eye relief lighting. 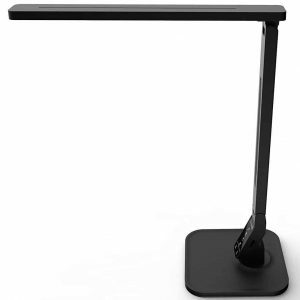 This LED desk lamp, has simulated natural light which is enhanced. It has been designed with 4 different lighting modes, 5 levels of brightness, and a dimmer which is touch sensitive. It comes in a modern design and does not require much space. You can even fold it down, and place it aside. You will be very pleased, with its automated 1 Hour Auto-Off Timer as well. he lamp can be recharged through any device that features a USB port. These include power adapters, computers, powerbank and more. The desk lamp however does not work with 220 volt power. 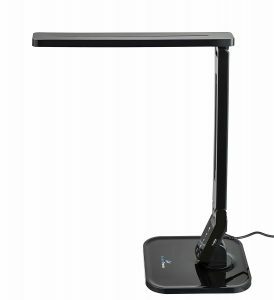 he led desk lamp doesn’t contain any toxic chemicals or produce ghosts but unfortunately does not work with batteries. The led lamp by Light Ever consists of a solid arm and head made from aluminum. The head’s ability to turn for 270 degrees and the base 340-degree rotation angle make adjusting the angle and brightness easy. This is boosted by the 7 Dimming Levels and the flicker-free and non-glare LEDs. 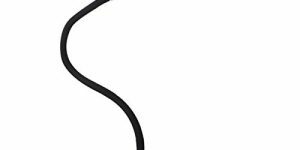 Some users argue that the hinge that holds the 8-watt lamp tends to become loose over time. 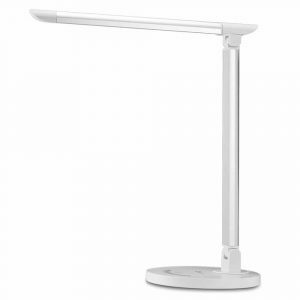 KEDSUM desk lamp consists of bright leds that produce 7 watts and offer 3 levels of dimming. It comes with a friendly clamp that can easily be adjusted to a height variance of up to 2.5 inches. 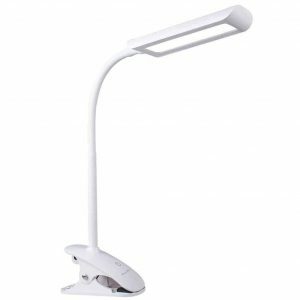 Many users appreciate its white light which is ideal for reading and writing and also love the touch-sensitive control section. And since the light doesn’t flicker or emit any ghosts, cases of aching, tired or red eyes are minimal. 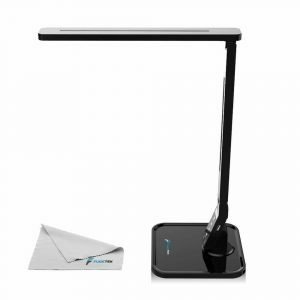 The TaoTronics LED desk lamp is fit for writing, drawing, reading and other a uses. It comes with 6-watt leds and is made using fairly strong but light aluminum metal and has a wide head for good light dispersion. The 3 levels of dimming, touch-sensitive mechanism and superior LED that doesn’t create ghost images guarantee you of quality lighting. Unfortunately, it’s suitable for small spaces only. When it comes to this lamp design, Fugetek is the only company which offers patented recessed LED’s. This is another excellent option, for people who don’t want lighting that’s hard on the eyes. Other LED options often have visible LED’s, which make can frustrate sensitive eyes. It comes in a space saving design and has a UL Certified Power Adapter. This is one of the most economic and reliable options you could go for. 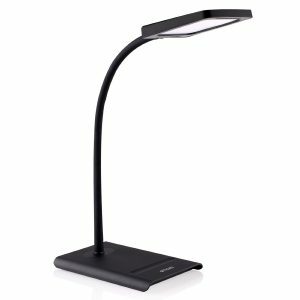 TaoTronics TT-DL01 led lamp is suitable for most types of desks and comes with powerful led that can last for as many as 25 years. It features 4 lighting modes, 5V/1Amp USB, 5 brightness levels and doesn’t flicker. Selecting the desired mode is done using the Touch-Sensitive control panel while the anti-glare characteristics protect your eyes. 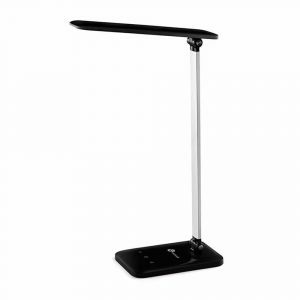 The black-colored LAMPAT Led desk lamp is made of 27 leds and comes with 5 levels of brightness. It feature 4 lighting modes, consumes no more than 11 watts and provides up to 530 lumens of brightness making it one of the brightest. 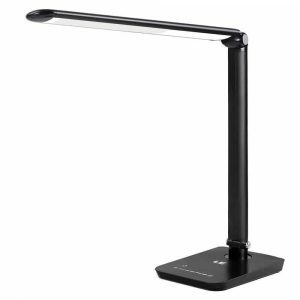 Although adjustable, the 2500-7000K led lamp only moves vertically and not horizontally. TaoTronics is an official Member of the Philips EnabLED Licensing Program. This shows you the level of performance you will get, when you start using it. I would recommend this for individuals with eye problems. It has been designed to be flicker-free and very gentle on the eyes. You can use it for studying, reading and even working. You will get to customize the kind of illumination you want. The LED lamp has 5 color modes, with 7 brightness levels for that purpose. 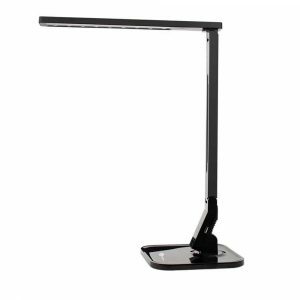 A closer examination of all the features desk lamps shows that they come with user-friendly designs and are easy to install/mount or remove, they don’t require lots of time or effort, and produce adequate light for most types of desks. They also are well-designed and will look elegant on the desk and come with energy-efficient leds that are not only bright but will last for many years. In fact, most allow you to adjust the light intensity or brightness and also the angle. The above summary on the 10 best LED desk lamps should help you make a better decision when looking for quality and reliable led lamps.